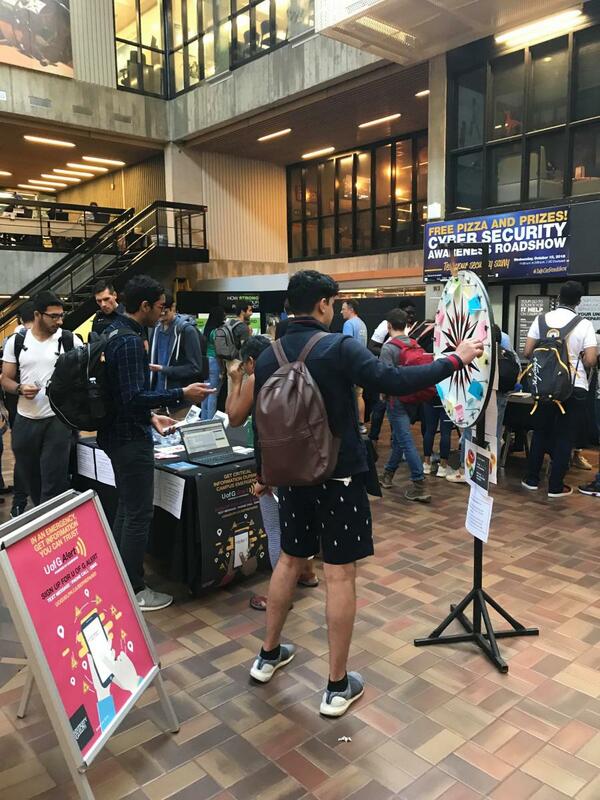 On Wednesday, October 10, the CCS Information Security (InfoSec) team hosted its fourth annual Cyber Security Awareness Roadshow, with the intent of raising overall cyber security awareness on campus. This event gives students, staff, and faculty the opportunity to directly interact with members of the InfoSec team to learn about security issues, safety precautions, and where to get help with IT-related issues. This year we had four main InfoSec booths set up, each covering a specific cyber security topic. These included phishing, device security, strong passwords, and social media safety. 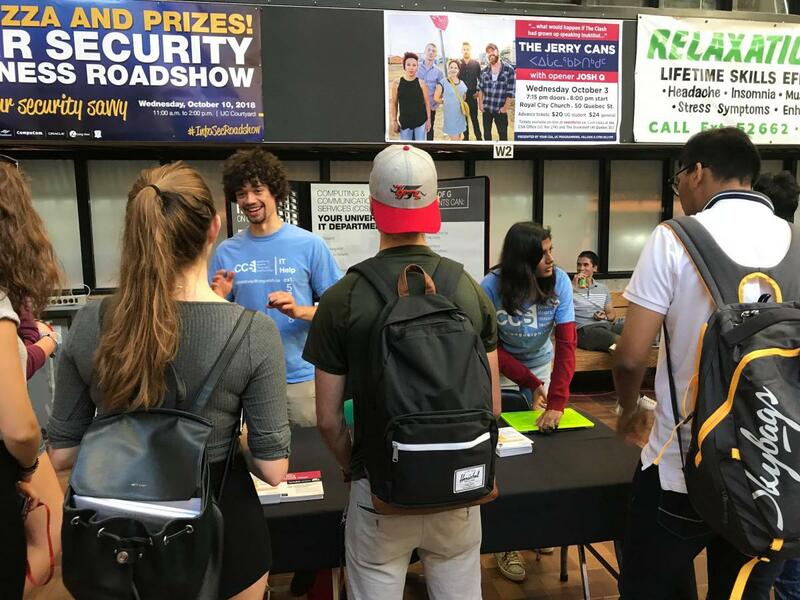 Each booth was staffed by experts from the InfoSec team, CCS staff members, and student staff, who communicated to our audience why they should care about each topic and what they can do to prevent being hacked by cybercriminals. There were also great booths from the Campus Police – who were raising awareness about U of G Alert – and the CCS IT Help Centre. Each of the four InfoSec booths were sponsored by our CCS vendor partners (Cisco, CompuCom, F5, ForeScout, IBM, McAfee, LongView, and Oracle). 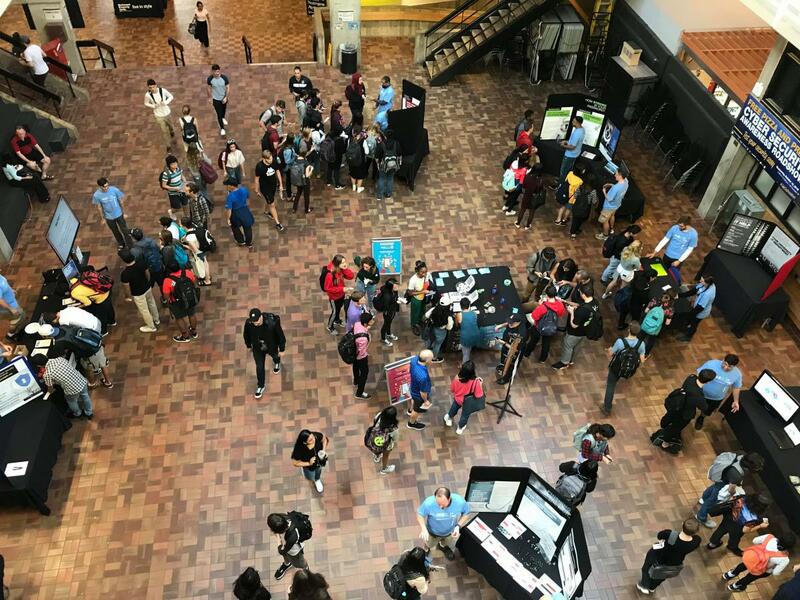 This year more than 500 students, staff, and faculty attended the Roadshow – a record for the event! – with each one of them walking away with new cyber security knowledge, swag, and free pizza! Some attendees even walked away with raffle prizes including an iPad, headphones, a wireless speaker, gift baskets and more! On behalf of CCS and the InfoSec team, we would like to thank everyone who attended this year’s Roadshow, as well as all the CCS volunteers and sponsors who made this event possible!